Tort Talk email subscribers now number in excess of 400 people in the insurance and legal industry! I send great thanks to all of the Tort Talkers who have signed up as email subscribers and hope to keep this blog informative, and (hopefully) interesting and entertaining. I am also very grateful and thank those of you who have advised me and sent me important decisions and news to post here on Tort Talk. 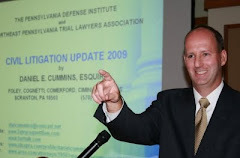 In the meantime, should I be able to assist anyone by providing a copy of any of the decisions I may have, or in any other way up here in Northeastern Pennsylvania, please do not hesitate to contact me at dancummins@comcast.net.